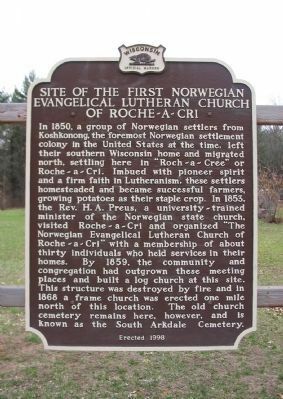 In 1850, a group of Norwegian settlers from Koshkonong, the foremost Norwegian settlement colony in the United States at the time, left their southern Wisconsin home and migrated north, settling here in "Roch-a-Cree" or Roche-a-Cri. Imbued with pioneer spirit and a firm faith in Lutheranism, these settlers homesteaded and became successful farmers, growing potatoes as the their staple crop. In 1853, the Rev. H. A. Preus, a university-trained minister of the Norwegian state church, visited Roche-a-Cri and organized "The Norwegian Evangelical Lutheran Church of Roche-a-Cri" with a membership of about thirty individuals who held services in their homes. 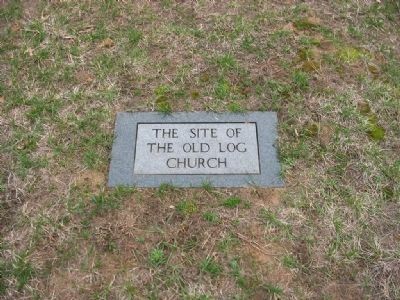 By 1859, the community and congregation had outgrown these meeting places and built a log church at this site. This structure was destroyed by fire and in 1868 a frame church was erected one mile north of this location. The old church cemetery remains here, however, and is known as the South Arkdale Cemetery. is included in the Wisconsin Historical Society marker series. Location. 44° 0.609′ N, 89° 55.132′ W. Marker is near Arkdale, Wisconsin, in Adams County. Marker is on Cypress Avenue west of 18th Avenue, on the left when traveling west. Touch for map. Marker is at the South Arkdale Cemetery. 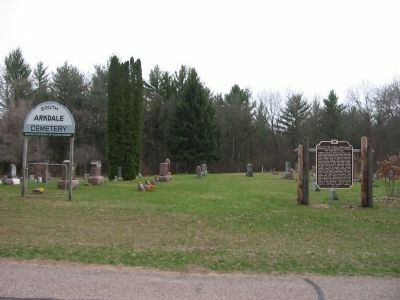 Marker is in this post office area: Arkdale WI 54613, United States of America. Touch for directions. Other nearby markers. At least 8 other markers are within 10 miles of this marker, measured as the crow flies. West Church (approx. one mile away); Lutheran Church of the Norwegian Synod (approx. 1.3 miles away); East Arkdale Cemetery (approx. 2.3 miles away); Roche-A-Cri State Park (approx. 5 miles away); Veterans Memorial / Cpl. Red Cloud Tribute (approx. 5.8 miles away); Monroe Cemetery (approx. 7.7 miles away); Soldiers Monument (approx. 8 miles away); Mrs Salter Killed Here (approx. 9½ miles away). Touch for a list and map of all markers in Arkdale. More. Search the internet for Site of the First Norwegian Evangelical Lutheran Church of Roche-a-Cri. Credits. This page was last revised on June 16, 2016. This page originally submitted on April 26, 2008, by Keith L of Wisconsin Rapids, Wisconsin. This page has been viewed 2,165 times since then and 30 times this year. Last updated on September 24, 2010, by William J. Toman of Green Lake, Wisconsin. Photos: 1, 2, 3. submitted on April 26, 2008, by Keith L of Wisconsin Rapids, Wisconsin. • Bill Pfingsten was the editor who published this page.